TODAY my dear sweet marshmallow readers I have a post that had been A LONG TIME in the making! Ru (of Short, Small & Sweet) advertised on my blog a few months ago and with an advertising package comes a guest post! She was awfully busy that month, then I was awfully busy, then she was some more... you catch my drift, it took awhile to get this post. But today is the day, lucky for me, still at busy home with the world's slowest internet, surrounded by boxes of beanie babies, Ru is taking over. I interviewed Ru '5 Faves' style to introduce you, she's amazing. Really. My mother loves her too and follows her blog, a definite seal of approval if ever there was one! ;) Have a nosy here & then make sure you pop on over to her blog for posts such as 'Brownie muffins with Almond Flour' and beauty products galore. I've always liked journaling and making lists, and I've kept diaries on and off since I was a kid. Blogging is another way of expressing myself and my creativity, and I enjoy sharing about my passion - which in this case, green beauty. Apart from that, the green beauty community is a wonderful place to make blogger friends and I'm happy to say that I've come to know a few of them better, and we interact a lot via social media. they make the community so wonderful by sharing their knowledge, and always showing support for one another. Every morning, I have either a glass of warm lemon water or wheatgrass powder and collagen powder mixed with orange juice after I wake up. It helps with the digestive system, which in turn benefits the complexion. Exercise is not only good for our bodies, but it supports healthy skin as well, so I make it a point to practice yoga everyday to get myself moving. Lip balm is an indispensable item as dry lips have always been the bane of my life. I keep them in my bag, on the dresser, and I make sure to place one permanently in every room of the house. Another thing that I always put on is concealer because having hormonal spots is no fun, 'nuff said. Finally, eyebrow powder. Even if I'm just running a quick errand, I won't leave the house without doing my brows - they complete your face. My husband. Errr he's not a thing but, yeah... He's my best friend and makes me laugh every single day, which is crucial to my mental well-being. Next is my MacBook, of course; what blogging would I do without it? And then my blog planner and black pens come to play. 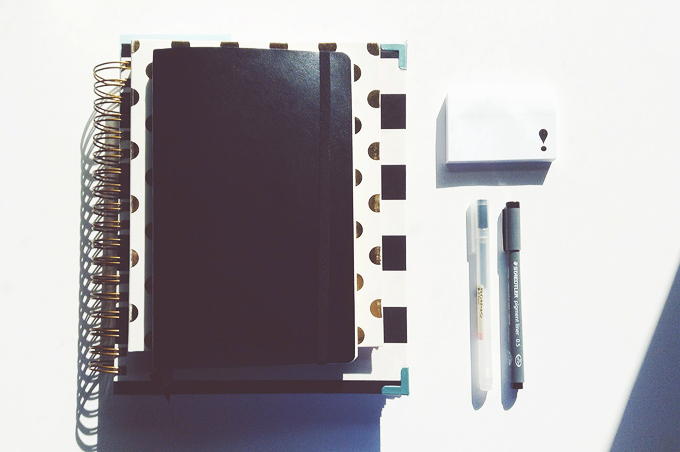 I began using a blog planner a few months ago, and it was one of the best decisions. It helps me stay focused and keep track of my ideas and reviews I have to complete. I'm a huge tea fan and have at least 2 cups a day. (I like black coffee with coconut oil too, but I limit my coffee intake to 1-2 times per week.) Some of my favourite teas are: dandelion root, ginger, chai, and green tea. As a female it's inevitable to have a sweet tooth. My weaknesses are dark chocolate or coconut macaroons - I can't decide on one. I try hard to reduce sugar consumption, so I save the dark chocs for TOTM, and make my own macaroons instead of buying them from bakeries/stores. Recently I started a 30-day challenge of doing yoga daily at 730am. It has been going well so far and I do hope that it will become a deep-rooted habit. 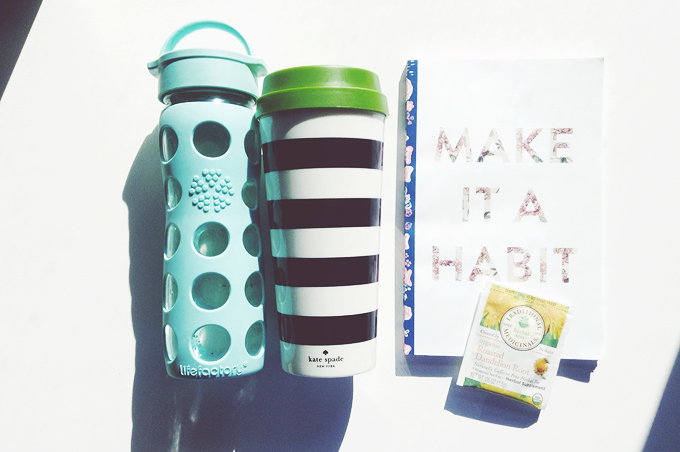 Tea-drinking while checking emails/social media is also an everyday thang. Every day after dinner or before I go to bed, I make it a point to send Whatsapp messages to my mum and sister in Singapore. Technology is awesome. Lastly, my husband and I spend some downtime together every night - just talking about our day, share our thoughts, etc. 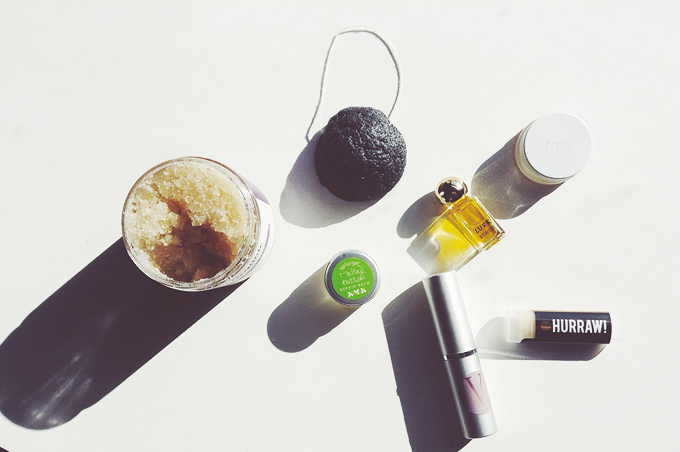 5 best green beauty discoveries. Disclaimer: I'm not playing favorites here, but these are the items that I've been loving, that makes me wonder what I would do without them. LURK perfume - I used to wear perfume/fragrance sprays a lot until 'turning green'. I didn't really know of any natural perfumes brands until I came across LURK Beauty. I love the minimalist-glam packaging, but at the same time was reluctant to fork out monies for that small bottle. It wasn't until when i got to test them in person at Follain, and I was convinced that RWS005 is my jam. Good things come to people who wait - I grabbed one of the Goodebox X A Night for Green Beauty box #4 which included RWS005, and now it's my HG scent! Brija Cosmetics Stolen Luxury highlight - This was my first highlighter and still the one I'm using today. Brija Cosmetics is an indie cosmetics brand by Brianna aka iluvjesse444 on Youtube (she makes awesome videos by the way). The stick form is really convenient, and it lends a subtle highlight even if you over-apply by accident. The best part? It's only USD$15. Fifteen! rms beauty un cover up - I'm sorry if you're allergic/reactive to coconut oil, but this product is simply awesome. It didn't work for me right from the start, but once I passed the blending learning curve, this is my go-to concealer. You can use it as a foundation if you like, and the small pot lasts a long time. Sugar scrubs - I'm an advocate for oily sugar scrubs. My dry legs need a lot of help and these scrubs keep them smooth and silky. Stop using conventional scrubs that uses walnut shells or plastic beads to exfoliate - they either scratch your skin or contribute to sea water pollution. Konjac sponges - Can we give a big hooray to this squishy tool? Other than being fun to use (stop squeezing it too much! ), konjac sponges gently buff your complexion whilst offering skincare properties. I like the ones made with charcoal or aloe vera - the former is great for combo-oily or blemished skin, and the latter comes in handy in winter to prevent flaking. They're perfect for the body as well, if sugar scrubs are not your thing. Love Ru! She has such lovely picks and tips.